Liczba stron: 350 Jest to ujednolicona liczba stron, która ułatwi Ci porównanie długości książek. Każda strona Legimi to 200 słów. in a time well before any electronic media was in use. 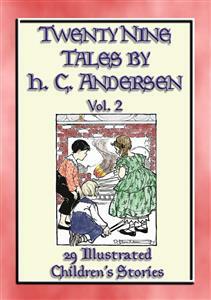 HE present volume is the second of the selected stories from Hans Andersen. Together the books include what, out of a larger number, are the best for children's use. The story-telling activity of this inimitable genius covered a period of more than forty years. Besides these shorter juvenile tales, there are a few which deserve to survive. "The Ice Maiden" is a standard, if not a classic, and "The Sandhills of Jutland" was pronounced by Ruskin the most perfect story that he knew. It adds a charm to the little stories of these two volumes to know that the genial author traveled widely for a man of his time and everywhere was urged to tell the tales himself. This he did with equal charm in the kitchens of the humble and in the courts and palaces of nobles. As was said in the preface to the first volume, wherever there are children to read, the stories of Hans Christian Andersen will be read and loved. "No, it is not ended," said the flax. "To-morrow the sun will shine or the rain descend. I feel that I am growing. I feel that I am in full blossom. I am the happiest of all creatures, for I may someday come to something." After some time the linen was taken into the house, and there cut with the scissors and torn into pieces and then pricked with needles. This certainly was not pleasant, but at last it was made into twelve garments of the kind that everybody wears. "See now, then," said the flax, "I have become something of importance. This was my destiny; it is quite a blessing. Now I shall be of some use in the world, as everyone ought to be; it is the only way to be happy. I am now divided into twelve pieces, and yet the whole dozen is all one and the same. It is most extraordinary good fortune." OW listen. Out in the country, close by the roadside, stood a pleasant house; you have seen one like it, no doubt, very often. In front lay a little fenced-in garden, full of blooming flowers. Near the hedge, in the soft green grass, grew a little daisy. The sun shone as brightly and warmly upon her as upon the large and beautiful garden flowers, so the daisy grew from hour to hour. Every morning she unfolded her little white petals, like shining rays round the little golden sun in the center of the flower. She never seemed to think that she was unseen down in the grass or that she was only a poor, insignificant flower. She felt too happy to care for that. Merrily she turned toward the warm sun, looked up to the blue sky, and listened to the lark singing high in the air. One day the little flower was as joyful as if it had been a great holiday, although it was only Monday. All the children were at school, and while they sat on their benches learning their lessons, she, on her little stem, learned also from the warm sun and from everything around her how good God is, and it made her happy to hear the lark expressing in his song her own glad feelings. The daisy admired the happy bird who could warble so sweetly and fly so high, and she was not at all sorrowful because she could not do the same. "I can see and hear," thought she; "the sun shines upon me, and the wind kisses me; what else do I need to make me happy?" Within the garden grew a number of aristocratic flowers; the less scent they had the more they flaunted. The peonies considered it a grand thing to be so large, and puffed themselves out to be larger than the roses. The tulips knew that they were marked with beautiful colors, and held themselves bolt upright so that they might be seen more plainly. They did not notice the little daisy outside, but she looked at them and thought: "How rich and beautiful they are! No wonder the pretty bird flies down to visit them. How glad I am that I grow so near them, that I may admire their beauty!" Just at this moment the lark flew down, crying "Tweet," but he did not go to the tall peonies and tulips; he hopped into the grass near the lowly daisy. She trembled for joy and hardly knew what to think. The little bird hopped round the daisy, singing, "Oh, what sweet, soft grass, and what a lovely little flower, with gold in its heart and silver on its dress!" For the yellow center in the daisy looked like gold, and the leaves around were glittering white, like silver. How happy the little daisy felt, no one can describe. The bird kissed her with his beak, sang to her, and then flew up again into the blue air above. It was at least a quarter of an hour before the daisy could recover herself. Half ashamed, yet happy in herself, she glanced at the other flowers; they must have seen the honor she had received, and would understand her delight and pleasure. But the tulips looked prouder than ever; indeed, they were evidently quite vexed about it. The peonies were disgusted, and could they have spoken, the poor little daisy would no doubt have received a good scolding. She could see they were all out of temper, and it made her very sorry. At this moment there came into the garden a girl with a large, glittering knife in her hand. She went straight to the tulips and cut off several of them. "O dear," sighed the daisy, "how shocking! It is all over with them now." The girl carried the tulips away, and the daisy felt very glad to grow outside in the grass and to be only a poor little flower. When the sun set, she folded up her leaves and went to sleep. She dreamed the whole night long of the warm sun and the pretty little bird. The next morning, when she joyfully stretched out her white leaves once more to the warm air and the light, she recognized the voice of the bird, but his song sounded mournful and sad. Alas! he had good reason to be sad: he had been caught and made a prisoner in a cage that hung close by the open window. He sang of the happy time when he could fly in the air, joyous and free; of the young green corn in the fields, from which he would spring higher and higher to sing his glorious song—but now he was a prisoner in a cage. The little daisy wished very much to help him. But what could she do? In her anxiety she forgot all the beautiful things around her, the warm sunshine, and her own pretty, shining, white leaves. Alas! she could think of nothing but the captive bird and her own inability to help him. Two boys came out of the garden; one of them carried a sharp knife in his hand, like the one with which the girl had cut the tulips. They went straight to the little daisy, who could not think what they were going to do. "We can cut out a nice piece of turf for the lark here," said one of the boys; and he began to cut a square piece round the daisy, so that she stood just in the center. "Pull up the flower," said the other boy; and the daisy trembled with fear, for to pluck her up would destroy her life and she wished so much to live and to be taken to the captive lark in his cage. "No, let it stay where it is," said the boy, "it looks so pretty." So the daisy remained, and was put with the turf in the lark's cage. The poor bird was complaining loudly about his lost freedom, beating his wings against the iron bars of his prison. The little daisy could make no sign and utter no word to console him, as she would gladly have done. The whole morning passed in this manner. "There is no water here," said the captive lark; "they have all gone out and have forgotten to give me a drop to drink. My throat is hot and dry; I feel as if I had fire and ice within me, and the air is so heavy. Alas! I must die. I must bid farewell to the warm sunshine, the fresh green, and all the beautiful things which God has created." And then he thrust his beak into the cool turf to refresh himself a little with the fresh grass, and, as he did so, his eye fell upon the daisy. The bird nodded to her and kissed her with his beak and said: "You also will wither here, you poor little flower! They have given you to me, with the little patch of green grass on which you grow, in exchange for the whole world which was mine out there. Each little blade of grass is to me as a great tree, and each of your white leaves a flower. Alas! you only show me how much I have lost." "Oh, if I could only comfort him!" thought the daisy, but she could not move a leaf. The perfume from her leaves was stronger than is usual in these flowers, and the bird noticed it, and though he was fainting with thirst, and in his pain pulled up the green blades of grass, he did not touch the flower. The evening came, and yet no one had come to bring the bird a drop of water. Then he stretched out his pretty wings and shook convulsively; he could only sing "Tweet, tweet," in a weak, mournful tone. His little head bent down toward the flower; the bird's heart was broken with want and pining. Then the flower could not fold her leaves as she had done the evening before when she went to sleep, but, sick and sorrowful, drooped toward the earth. Not till morning did the boys come, and when they found the bird dead, they wept many and bitter tears. They dug a pretty grave for him and adorned it with leaves of flowers. The bird's lifeless body was placed in a smart red box and was buried with great honor. Poor bird! while he was alive and could sing, they forgot him and allowed him to sit in his cage and suffer want, but now that he was dead, they mourned for him with many tears and buried him in royal state. But the turf with the daisy on it was thrown out into the dusty road. No one thought of the little flower that had felt more for the poor bird than had anyone else and that would have been so glad to help and comfort him if she had been able. HERE were once five peas in one shell; they were green, and the shell was green, and so they believed that the whole world must be green also, which was a very natural conclusion. The shell grew, and the peas grew; and as they grew they arranged themselves all in a row. The sun shone without and warmed the shell, and the rain made it clear and transparent; it looked mild and agreeable in broad daylight and dark at night, just as it should. And the peas, as they sat there, grew bigger and bigger, and more thoughtful as they mused, for they felt there must be something for them to do. "Are we to sit here forever?" asked one. "Shall we not become hard, waiting here so long? It seems to me there must be something outside; I feel sure of it." Weeks passed by; the peas became yellow, and the shell became yellow. "All the world is turning yellow, I suppose," said they—and perhaps they were right. Suddenly they felt a pull at the shell. It was torn off and held in human hands; then it was slipped into the pocket of a jacket, together with other full pods. "Now we shall soon be let out," said one, and that was just what they all wanted. "I should like to know which of us will travel farthest," said the smallest of the five; "and we shall soon see." "Crack!" went the shell, and the five peas rolled out into the bright sunshine. There they lay in a child's hand. A little boy was holding them tightly. He said they were fine peas for his pea-shooter, and immediately he put one in and shot it out. "Now I am flying out into the wide world," said the pea. "Catch me if you can." And he was gone in a moment. "I intend to fly straight to the sun," said the second. "That is a shell that will suit me exactly, for it lets itself be seen." And away he went. "We will go to sleep wherever we find ourselves," said the next two; "we shall still be rolling onwards." And they did fall to the floor and roll about, but they got into the pea-shooter for all that. "We will go farthest of any," said they. "What is to happen will happen," exclaimed the last one, as he was shot out of the pea-shooter. Up he flew against an old board under a garret window and fell into a little crevice which was almost filled with moss and soft earth. The moss closed itself about him, and there he lay—a captive indeed, but not unnoticed by God. Within the little garret lived a poor woman, who went out to clean stoves, chop wood into small pieces, and do other hard work, for she was both strong and industrious. Yet she remained always poor, and at home in the garret lay her only daughter, not quite grown up and very delicate and weak. For a whole year she had kept her bed, and it seemed as if she could neither die nor get well. "She is going to her little sister," said the woman. "I had only the two children, and it was not an easy thing to support them; but the good God provided for one of them by taking her home to himself. The other was left to me, but I suppose they are not to be separated, and my sick girl will soon go to her sister in heaven." All day long the sick girl lay quietly and patiently, while her mother went out to earn money. Spring came, and early one morning the sun shone through the little window and threw his rays mildly and pleasantly over the floor of the room. Just as the mother was going to her work, the sick girl fixed her gaze on the lowest pane of the window. "Mother," she exclaimed, "what can that little green thing be that peeps in at the window? It is moving in the wind." The mother stepped to the window and half opened it. "Oh!" she said, "there is actually a little pea that has taken root and is putting out its green leaves. How could it have got into this crack? Well, now, here is a little garden for you to amuse yourself with." So the bed of the sick girl was drawn nearer to the window, that she might see the budding plant; and the mother went forth to her work. "Mother, I believe I shall get well," said the sick child in the evening. "The sun has shone in here so bright and warm to-day, and the little pea is growing so fast, that I feel better, too, and think I shall get up and go out into the warm sunshine again." "God grant it!" said the mother, but she did not believe it would be so. She took a little stick and propped up the green plant which had given her daughter such pleasure, so that it might not be broken by the winds. She tied the piece of string to the window-sill and to the upper part of the frame, so that the pea tendrils might have something to twine round. And the plant shot up so fast that one could almost see it grow from day to day. "A flower is really coming," said the mother one morning. At last she was beginning to let herself hope that her little sick daughter might indeed recover. She remembered that for some time the child had spoken more cheerfully, and that during the last few days she had raised herself in bed in the morning to look with sparkling eyes at her little garden which contained but a single pea plant. A week later the invalid sat up by the open window a whole hour, feeling quite happy in the warm sunshine, while outside grew the little plant, and on it a pink pea blossom in full bloom. The little maiden bent down and gently kissed the delicate leaves. This day was like a festival to her. "Our heavenly Father himself has planted that pea and made it grow and flourish, to bring joy to you and hope to me, my blessed child," said the happy mother, and she smiled at the flower as if it had been an angel from God. But what became of the other peas? Why, the one who flew out into the wide world and said, "Catch me if you can," fell into a gutter on the roof of a house and ended his travels in the crop of a pigeon. The two lazy ones were carried quite as far and were of some use, for they also were eaten by pigeons; but the fourth, who wanted to reach the sun, fell into a sink and lay there in the dirty water for days and weeks, till he had swelled to a great size. "I am getting beautifully fat," said the pea; "I expect I shall burst at last; no pea could do more than that, I think. I am the most remarkable of all the five that were in the shell." And the sink agreed with the pea. But the young girl, with sparkling eyes and the rosy hue of health upon her cheeks, stood at the open garret window and, folding her thin hands over the pea blossom, thanked God for what He had done. N the last house in the village there lay a stork's nest. The mother stork sat in it with her four little ones, who were stretching out their heads with their pointed black bills that had not yet turned red. At a little distance, on the top of the roof, stood the father stork, bolt upright and as stiff as could be. That he might not appear quite idle while standing sentry, he had drawn one leg up under him, as is the manner of storks. One might have taken him to be carved in marble, so still did he stand. "Stork, stork, fly away;Stand not on one leg to-day.Thy dear wife sits in the nest,To lull the little ones to rest. "There's a halter for one,There's a stake for another,For the third there's a gun,And a spit for his brother!" "The first will be hanged,The second be hit." AR away, in the land to which the swallows fly when it is winter, dwelt a king who had eleven sons, and one daughter, named Eliza. The eleven brothers were princes, and each went to school with a star on his breast and a sword by his side. They wrote with diamond pencils on golden slates and learned their lessons so quickly and read so easily that everyone knew they were princes. Their sister Eliza sat on a little stool of plate-glass and had a book full of pictures, which had cost as much as half a kingdom.